Keith (Barney) Wickham Allen (Service No 2259) was the grandson of Walter Allen and Charlotte Dunster of Shellharbour who operated Allen’s Store in Addison Street from 1868. The Allen family lived in the house next to the store. When Keith's grandfather died in 1876, his grandmother and other family members continued the business for generations. Clothing and other goods were ordered from the store by the townsfolk, and arrived by ship, train or mail. Keith was born 19 September 1893, the son of Joseph Dunster Allen and Anne Rachel Wickham. He grew up in Shellharbour and attended Newington College at Stanmore. In 1906, when he was just 13 years old, he joined the Senior Cadets and six years later received his Bronze Medal from the Royal Life Saving Society. He became a partner in Bjelke-Petersen Bros Gymnasium in 1910 when he was 17 years old and became involved in developing programs and teaching physical education in many leading colleges and convents in the Sydney area. The Bjelke- Petersen brothers, Hans Christian, Johannes and Harald established gymnasiums in Hobart, Melbourne and Sydney and specialised in treating people with deformities of the spine. In November 1915 Keith enlisted in the AIF. He completed his training at Goulburn and acted as Sergeant on several occasions during this time. Keith embarked for Plymouth on the Port Sydney with 55th Battalion, D Company, in September 1916. He was appointed Sergeant In October 1916, and in December of that year he proceeded to France where he reverted to the rank of Private. Keith served in France from December 1916 to June 1918. In February 1917 Keith was hospitalised due to illness. Just a month later, in March, he was wounded in action and hospitalised. On 8 April 1917 he rejoined the 55th Battalion and was with them for just 11 days before being evacuated to hospital, suffering from ‘shellshock’. Keith rejoined his Battalion in May 1917 and in June was promoted to Sergeant. He attended the Army Infantry School in November and rejoined the 55th Battalion in December 1917. Keith was selected to attend the Officers Cadet Battalion at Oxford in June 1918. A report on Keith’s training revealed ‘Cadet Allen has plenty of ability and has given satisfaction in every way. He will in my opinion make a good Platoon Commander’. November 1918 was Armistice Day and Keith remained overseas for a time serving in several different posts. In January 1919 he was appointed 2nd Lieutenant on probation and allotted to the General Infantry where he travelled to France via Southampton. Barney served as 2nd Lieutenant with the 5th Division Reinforcements, before being sent to P & RT (Physical Training) School, where he was involved in helping troops gain the required fitness to be able to return to Australia by ship. Mr and Mrs J D Allen of Shellharbour received a cable from Oxford stating that their son Keith Wickham Allen was now a Lieutenant. Lt Allen had just completed a six month course at Magdalene College Oxford after having put in two years heavy work in France during which he had an argument with shells upon three different occasions, one being nearly too much for him as it rendered him unconscious for several days. Lt Allen was stationed in Goulburn camp for some time and has many friends here. In April 1919 Barney disembarked for Southampton and was appointed Sports Officer with the 14th Brigade at Weymouth, and he remained at this posting until his return to Australia. In July 1919 board the HMAT Ulysses for Australia. When Keith returned, his rank was Lieutenant. Keith rejoined Bjelke- Petersen Brothers on his return and in December 1923 he married Valmai Jean Woodley Taylor Gilder. Keith and Valmai had four children: Wickham Taylor Allen, born 27 January 1927; Louise Ann Allen, born 9 January 1929; Michael Taylor Allen, born 13 March 1931; Keith (Kim) Taylor Allen, born 7 January 1933. On 1 April 1940, Keith enlisted for service in World War Two. 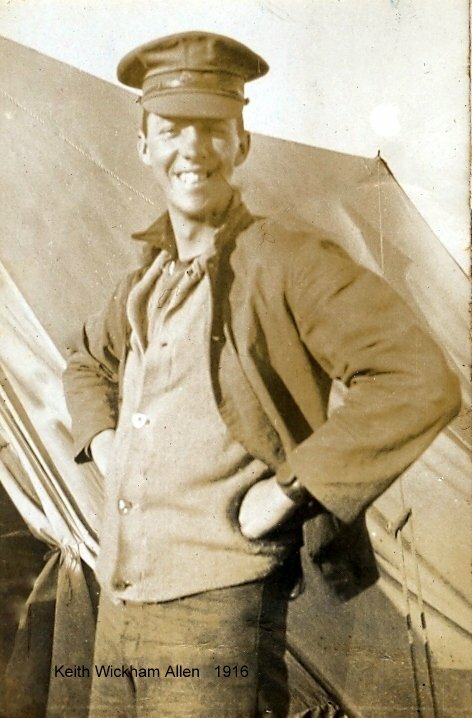 He was eager to serve overseas and was on the docks at Freemantle to board a ship bound for New Guinea to fight in the war against the Japanese. An order stated he was to remain behind as he was more useful getting the troops fit before they embarked for overseas. He was also to train the instructors who would carry on the job on board the ship. In 1944 Keith Wickham Allen was placed on the Retired List. In 1938 Keith joined Sydney Legacy and became a Legatee in July of that year. He was a member of the Junior Welfare Committee 1938-1962, after which he became a Reserve Member (retired). Keith became Managing Director of Bjelke-Petersen Brothers from 1948 to 1962 and served as Chairman of Directors until his death in May 1972. Keith was stationed in Goulburn camp for some time and has many friends here. In April 1919 Barney disembarked for Southampton and was appointed Sports Officer with the 14th Brigade at Weymouth, and he remained at this posting until his return to Australia. In July 1919 board the HMAT Ulysses for Australia. When Keith returned, his rank was Lieutenant.